This is the eighth installment of my series documenting all the women in Star Wars features films. This time I’m tacking the first stand-alone Star Wars film, Rogue One. Rogue One is an interesting case because the events in the story directly precede the opening sequence of Star Wars Episode IV: A New Hope. I think even people who didn’t care for Rogue One would agree that the look and feel of the film is remarkably reminiscent of A New Hope. Another unfortunate similarity between A New Hope and Rogue One, however, is the lack of many female supporting, and in some cases background, characters. This isn’t the first Star Wars film that lacks a variety of dynamic female characters (I’m looking at you Empire Strikes Back and Revenge of the Sith) but that doesn’t mean that Rogue One isn’t a good movie. It turns out some of my favorite Star Wars movies don’t have many women in them, and I enjoyed Rogue One quite a bit. Do I wish there were more women in Rogue One? Sure. 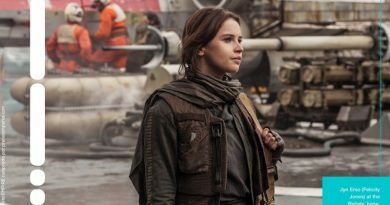 Does it make sense to the story that there aren’t more women in Rogue One? Sometimes yes, and sometimes no, but overall I would argue that it does not make much sense and it was an odd (and disappointing) choice to have so few female characters in the film. Before we dive into the movie I want to stress up front that analyzing where women are and aren’t in Rogue One should not detract from the praise the film rightly received for casting racially diverse actors. There are a lot of wonderful and memorable new characters in Rogue One, and the acting in the film was a pleasure to watch. Now let’s get started and look at the women of Rogue One. Female characters are introduced early in the film on the planet Lah’mu. The Erso family hideout has been discovered by Orson Krennic. Lyra Erso (Valene Kane) and her daughter Jyn (played by Beau and Dolly Gadson in different parts of the film) are trying to escape along with Jyn’s father Galen. Several fans have suggested how great it would have been if Lyra and Galen’s roles would have been switched in the film. I wholeheartedly agree with this idea despite my opinion that Mads Mikkelsen did a great job playing Galen. Lyra was a scientist (this was explored in the Rogue One prequel novel Catalyst) just like Galen, and there are too many dead mothers in Star Wars films we barely (or never) see on screen. Even though both of Jyn’s parents die in the film at some point, it would have been wonderful to see more of Lyra in Rogue One. Young and older Jyn are linked visually with a cut between young Jyn looking up from her dark hiding place and a close-up shot of an older Jyn sleeping. Actress Felicity Jones plays Jyn throughout the rest of the movie. A few women are among the crowd in the Ring of Kafrene Trading Outpost where Cassian Andor learns of an Imperial superweapon. In the Imperial labor camp on Wobani, Jyn is joined by another female prisoner who can be spotted on the far right of the screenshot below. At the Rebel Alliance Headquarters on Yavin 4, Mon Mothma (Genevieve O’Reilly) talks to Jyn about her father’s role in building a weapon for the Empire. Jyn Erso is a fascinating character to me, partly because she’s difficult to immediately pin down. I love that the main female character in Rogue One isn’t cheerful and isn’t pushing people aside for the chance to join the Rebellion. When we meet her Jyn wants nothing to do with the Rebellion. She is a survivor who is guarded and not looking for friends, fame, or a fight against the Empire. But as the movie progresses we see that Jyn also has a brave heart as she becomes one of many unlikely heroes. As Jyn walks through Rebel Headquarters it’s hard to tell if the people in the background are men or women, but most of them appear to be men. In Jedha a wide range of women both young and old are easy to spot in the crowd scenes. A young girl (Pendra Siliu played by Ivy Wong) separated from her mother screams in terror. The girl’s mother soon comes to pull her over to safety. More women in Jedha can be seen below. 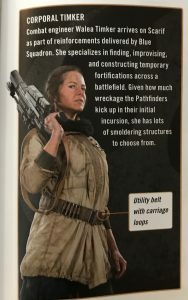 One of the interesting issues about Rogue One that I discovered when paging through the Rogue One Visual Ultimate Visual Guide is that there are a few female characters who get singled out in the book that are difficult to spot in the film (mostly due to their costumes). In some cases, these characters may have never appeared in the film – which is a scenario that happens in all Star Wars films. 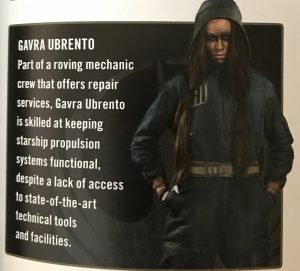 Two examples of female characters in Jedha who are not easily identified as female or are hard to find in a scene are Killi Gimm and Gavra Ubrento . A female Twi-lek dances in a hologram in Saw Gerrera’s hideout. A female member of Saw’s militia, Magva Yarro (unknown actress), can briefly be seen right before Jyn is reunited with Saw. I should note that I only really knew this character was female after I saw her profiled in the Visual Guide. The scene is just too dark to see many details. There were no female Imperials in A New Hope, and Rogue One is no different as you can see below. Even the scientists working with Galen on Eadu are all male. You could argue that a male-only Empire is what audiences were used to during this time period and was the right decision here. However, it’s also relevant that several female Imperials have been introduced during this time period in recent Star Wars books, comics, and animation. 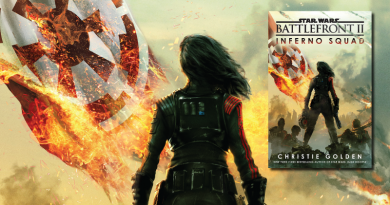 In the Rogue One prequel novel Catalyst, women scientists work in tandem with Galen Erso on Death Star technology. Back at Yavin, Senator Tynnra Pamlo of Taris (Sharon Duncan-Brewster) discusses Jyn’s plan to steal the plans for the Death Star. This is a small role but an important one in Star Wars as black actresses have rarely played humans in Star Wars films. Besides Mon Mothma it doesn’t look like there are any women at all in this wide shot in Yavin. Some of the diversity in the Rebel Alliance was added during reshoots overseen by Tony Gilroy. The following two screenshots show that there are a few women in the room in addition to Jyn and Mon Mothma, but you have to REALLY look hard for them. It’s nice that there are a few women scattered in this Rebel battle planning scene (there were none besides Leia in A New Hope) but why couldn’t one of the characters below have been female? 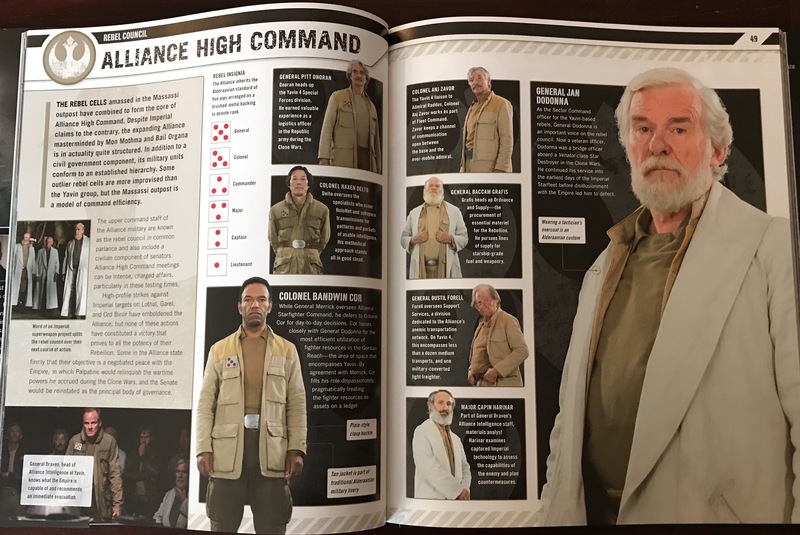 Several of the characters in this spread debuted in Rogue One. The screenshot below shows the rebels who are volunteering to join Jyn. There are a lot of people in this shot but none of them are obviously female. There are so few women shown in previous Yavin shots that sadly it kind of does make sense (within this film) that there aren’t any here. This is Jyn’s most powerful visual moment in the film for me. She’s alone in the shot, as she’s been in her life for years, but she’s now surrounded by a group of people that believe in her. There are no women on the ship with Jyn, at least as they are credited in the Visual Dictionary. Maybe the person in the screenshot below to the left of Chirrut? At the beginning of the battle, there are no signs of women in the Rebel Base or on the ground at Scarif. There is, however, a reference to a popular female character in Yavin when General Syndulla’s name is called over the intercom. This is, of course, a reference to Hera Syndulla from Star Wars Rebels. 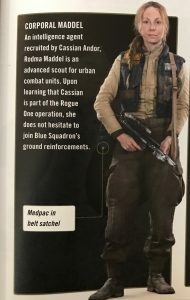 According to the Visual Guide two female characters are part of the reinforcements on the ground during the Battle of Scarif – Corporal Timker and Corporal Maddel. But neither of these women is easily spotted in the film. It’s too bad one of these characters wasn’t on the ship with Jyn and Cassian. Those characters, such as the man in the screenshot below, got a fair amount of screentime. During the Battle of Scarif there are a lot of close-up shots of Rebel pilots. Three of these pilots are women, and they all have lines of dialogue. It was refreshing seeing women being represented in these scenes after struggling to find them in so many previous sequences. Jaldine Gerams (Blue Three) was played by actress Geraldine James. I couldn’t find the name of the actress who played Lauren Goma (Blue Eleven). Goma is the only female character, besides Jyn, that I could spot that made it beyond the shield onto the beaches of Scarif. The third female pilot in this sequence was X-Wing Pilot Wona Goban (Gold Nine) played by Gabby Wong. 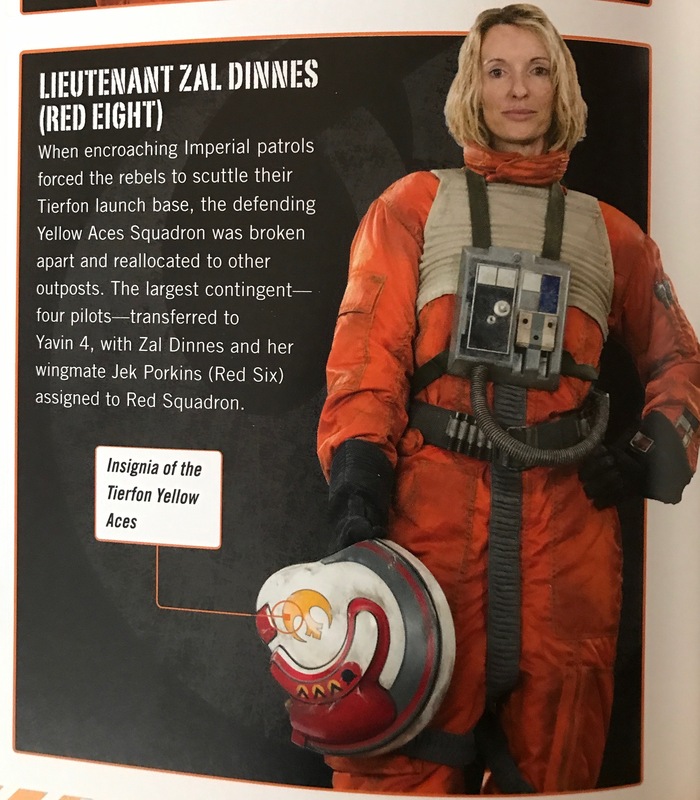 One female pilot (Zal Dinnes) was profiled in the Rogue One Ultimate Visual Guide but is not easily spotted in the film. A photo of Evaan Verlain’s helmet also makes an appearance in the Rogue One Visual Guide. Verlaine was a female pilot who fought in the battle of Yavin and debuted in the Princess Leia comic series. It would have been delightful to see a glimpse of Evaan Verlaine in Rogue One and I’m not sure why that didn’t happen unless her addition to this book was a last minute idea. I do wonder why there weren’t any female pilots visible in the previous Yavin scenes. It doesn’t seem to make a lot of sense that you don’t see even one female Rebel pilot or crew member, but I’m pleased there were a few female pilots in the Battle of Scarif sequence. 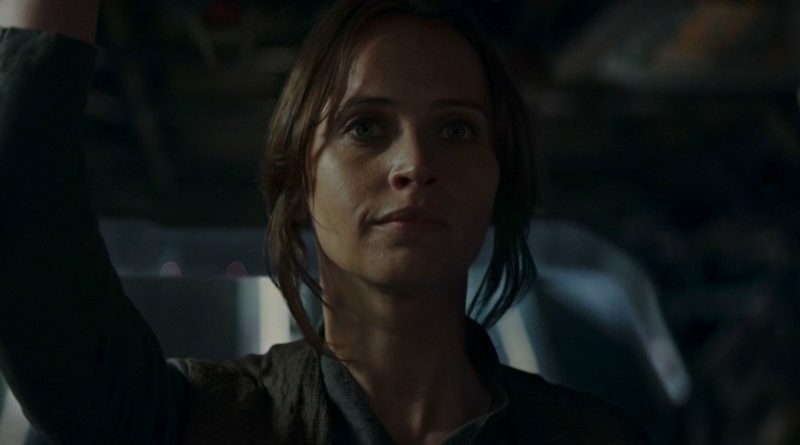 The last woman in Rogue One is none other than Princess Leia Organa (with the help of CG and actress Ingvild Deila), the first woman seen in A New Hope. An extremely male-heavy cast in Rogue One may have meshed well with A New Hope, but it didn’t sit well with a lot of Star Wars fans. It also doesn’t fit in well with many recent new books, comics, and animated shows produced during the A New Hope time period that include a fair number of female characters fighting on both sides. 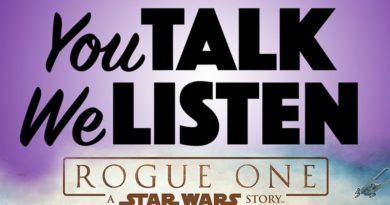 Was the lack of female roles in Rogue One intentional? It’s hard to know. Did the lack of female roles matter to the overall enjoyment of the movie to most people? I stated above my bias that I love this movie despite the lack of women in it, but would I have liked it better if more of the new characters (Krennic, Cassian, Chirrut, Baze, Saw, or Bodhi, etc.) would have been female? My answer is yes. Rogue One is successful to me primarily because of the quality of the characters, but more female diversity would have drawn me into the film even more. Next up for this series is Episode VIII: The Last Jedi. 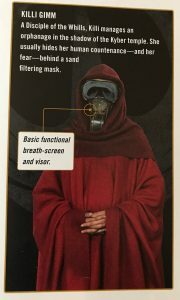 Sources: Wookieepedia, IMDB, and the Rogue One Ultimate Visual Guide, which if you enjoyed Rogue One is a book I highly recommend. To learn more about women in the Star Wars universe check out my 365 Days of Star Wars Women project. Lyra Erso has already been profiled on Day 14.